[Guest post by T.K. Justin Ng in Helsinki] Earlier this month, I moved to Helsinki from Ontario, Canada, to do an internship as part of my university's program. As an avid sketcher, my goal apart from working hard at the office is to sketch as much as I can. After all, who knows when I will visit Finland again. Below is a sketch I did on my flight from Toronto to Copenhagen. For some reason the watercolour acted a little like marker on the plane – let me know if this has happened to you before. I suspect it has to do with cabin pressure or the paper (Moleskine) or the fact that there is a bit of alcohol in the water for winter sketching. On the left is a small sketch of people de-icing the plane right before takeoff. The weather in Helsinki is similar to that in Toronto but I was shocked the first day when I realized how much more snow there is here. The cars parked on the smaller residential streets in the districts of Kamppi or Punavuori were buried in snow. The tricky part about sketching Helsinki is that it is too cold to do a complete and controlled sketch outside. On top of that, the sun sets at 4pm. Before coming to Helsinki, I had read up on Nina Johansson's tips on sketching in the winter with alcohol in the water brush. I tried this technique in Toronto but the way the watercolour reacted was very unpredictable. Although the lack of control felt exciting, being in a new city for the first time meant I wanted to create sketches that capture the beauty of the city with control. As I spend more time here, I will most likely loosen up and produce more relaxed sketches. In the meantime, the more elaborate sketches are drawn in ink (without the shading) on location but I move to a cafe nearby to complete it on the same day when my memory is still fresh. Here is the Helsinki railway station, Rautatientori. One thing that I really enjoyed was the orange brick post office in middle of the sketch. After inking it, I went into the popular Fazer Cafe to have a cup of tea and add the colour. I plan on drawing a few close-up sketches of this train station soon. Sketching in Hong Kong is very different from sketching in Helsinki. People here never come up to look at the drawing, start a conversation or take a photo. This was a gloomy day so I stayed in the neighbourhood to sketch this Methodist church. The yellow and green vehicle is the tram. As the weather worsened the next day, I stayed indoors in a beautiful Swedish cafe called Johan and Nyström. I decided to relax a little for this sketch and ended up really loving it. 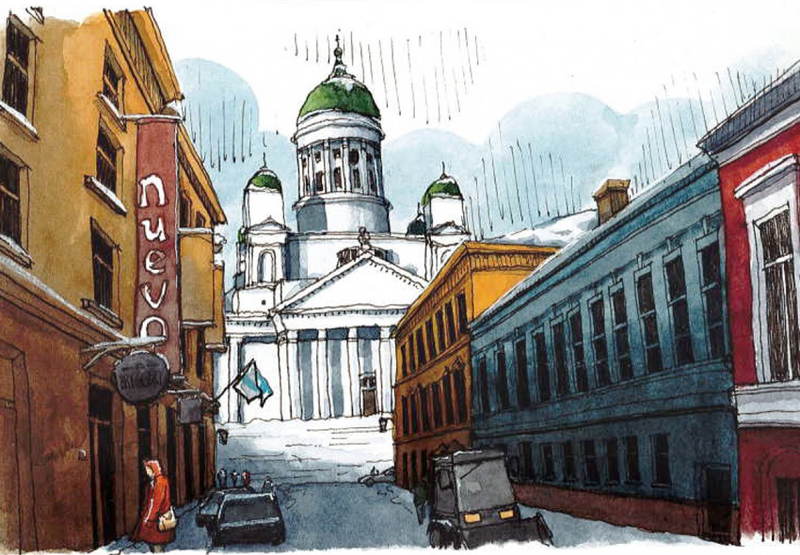 On the left of this page is a sketch of Helsinki Cathedral in the morning. It was foggy and the sketch turned out rather dull. On the right is the Kamppi Food Market, a great place for lunch, ranging from ramen to street gastro sandwiches. And finally, a sunny day. I drew the cathedral again, but this ended up a little too rigid. What I really liked about the cathedral was its relationship to the streets nearby. I might draw the cathedral from other angles, maybe even from the island off the city. I'm here for a few more months anyway. T.K. Justin Ng is an architecture student from the University of Waterloo in Canada currently doing an internship in Helsinki. He is a member of Urban Sketchers Hong Kong and Toronto. You can see more of Justin's sketches here.